Set in a 45-story tower on the Mandalay Bay Resort complex, this high-end, all-suite hotel is 0.6 miles from Bali Hai Golf Club and 1.9 miles from upscale shopping at CityCenter. 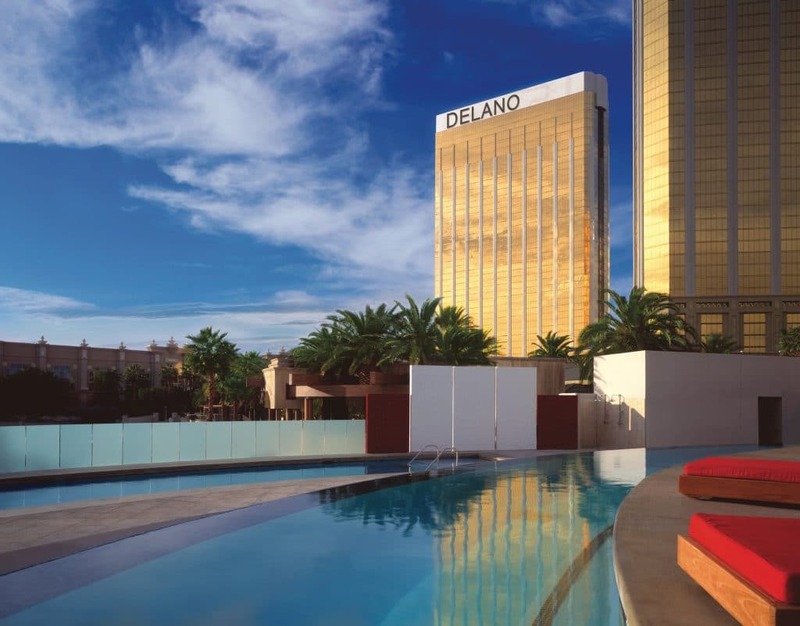 The Delano Hotel, which is connected to Mandalay Bay, is a boutique-style luxury property. It is a 45-story 1,117 room luxury suite hotel. It is owned and operated by MGM Resorts International. *The links in this post contain affiliate links and I will receive a small commission if you make a purchase after clicking on my links. If you like the high-end Delano Las Vegas, then you will definitely also enjoy the Bellagio Las Vegas as well with its shops, shows, pools & spas, and monorail access. For more Las Vegas resort military discounts, promotions, and special deals similar to the Caesars Palace Las Vegas military discount, be sure to check out our awesome listing of over 100+ Las Vegas resort and casino military discounts and deals. Terms and Conditions: The credit or debit card used to reserve your reservation will be required upon arrival to register. MGM will place an authorization against this account to cover applicable charges for room, tax and resort fees, as well as a ($100) incidental amount per day to allow you access to room charging privileges and may result in additional authorizations should your charges exceed the originally approved amount. Guests using a debit card in lieu of a credit card acknowledge unused funds are released upon check-out may take 3-7 business days for domestic banks and up to 30 days for international banks to become available through their financial institution.